Same-day pricing offered - We always return calls promptly. Daniel’s Lawn Care is Sumter’s trusted lawn care and landscaping specialist, offering lawn mowing, tree trimming, landscape design, mulch delivery and much more. We pride ourselves on providing prompt, friendly and high quality service along with expert workmanship. Call for a free estimate! There are few things you can do to convey the pride you feel for your property quite as effectively as keeping a nicely trimmed and manicured lawn. Whether you’re a homeowner or a business owner, a great lawn can do wonders for the overall look of your property. But keeping a lawn looking clean and well cared for is hard work. It takes time, it’s exhausting and many people just dread the work involved. This is why lawn care and landscaping in Sumter, SC is a perfect job for the pros. 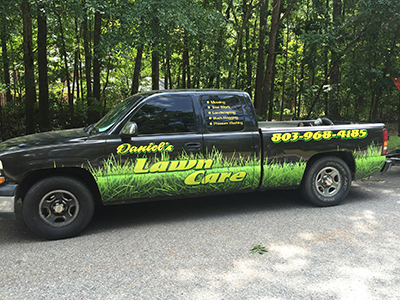 At Daniel’s Lawn Care, we love the hard work involved in caring for our customers’ green space, and we love seeing how happy and satisfied our customers are when they’ve hired us for lawn care in Sumter, SC. We provide a complete range of lawn care and landscaping services for residential as well as commercial clients. We’ve been a proud local lawn care company in Sumter, SC since 2001. We work with our customers to establish schedules, services and budgets that meet their needs. We’re known for prompt and friendly service. Our rates are very competitive, and we provide free quotes. To begin scheduling service, receive a free estimate or learn more about what we offer, call Daniel’s Lawn Care today at (803)968-4185! "Daniel and his crew have been servicing my lawn for over a year now and they have done an incredible job. They are on time, consistent, cour..."
"I am in the military and desperately needed my lawn cut while waiting for my household goods to arrive. Daniel and his team came out gave me..."
"Very accomadating! Very professional at all times! Quality lawn care and maintenance at comparable prices! Best customer service in town!! " November 11, 2016 Tamie B. "Highly recommend Daniel's Lawn Care! Do an outstanding job and very dependable." "Best lawn care I've ever had. Professional, polite, and accommodating."